Bill Nickerson of Liverpool is survived by his wife of 80 years, Bertie. 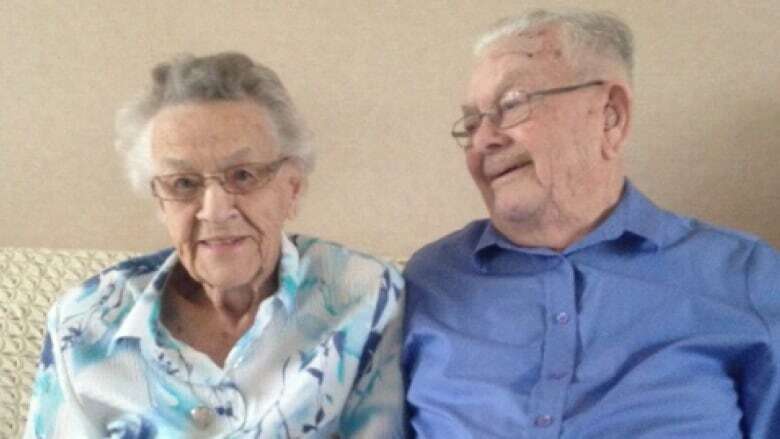 Bill Nickerson, half of one of Canada's longest-married couples, had died at the age of 101. Bill and his wife, Bertie, celebrated their 80th wedding anniversary last December. The couple, from Liverpool on Nova Scotia's South Shore, got married in 1935. It was a week after Bertie's 18th birthday. Bill was 21. Last year, after they celebrated their latest anniversary, Bill told CBC News that his secret to a long marriage was simple. "All you have to do is agree," he said. "I wouldn't trade her for the world, I love her every minute." Bill passed away at home on Sunday, according to his obituary. The couple said late last year that they wanted to continue to live in the family home they built 65 years ago. Bill had several heart attacks, but a network of friends and family kept an eye out on the couple. Bill worked for Bowater Mersey Paper for 40 years until his retirement, and was a founding member of the Liverpool Fire Department. The couple lost one of their two sons, Michael, after he suffered a heart attack five years ago. Bill is survived by his wife, who is 98, and his son Peter along with three grandchildren and two great-grandchildren. During a CBC interview in 2013 to mark their 78th anniversary, Bertie told Bill he had to stick around. "I wasn't going to live here alone," she told him. "You've got to stay around. You remember that, boy. Don't you go and leave." Last year, Bill told CBC that he'd live forever with Bertie by his side.